Edible rose petals provide an elegant twist to this traditional Indian ice cream. Kulfi, derived from the Persian word for “covered cup,” is a traditional Indian dessert that originated during the Mughal Empire in the 16th century. This thick, creamy dessert is much denser than the traditional whipped ice cream one generally finds in the west. The density of the milk not only makes this dessert incredibly rich, but it also means that it takes much longer to melt than typical western ice cream. During Mughal times, the milk was flavored with pistachios, saffron and cardamom, and poured into metal cones which were then immersed in slurry ice until they were frozen. 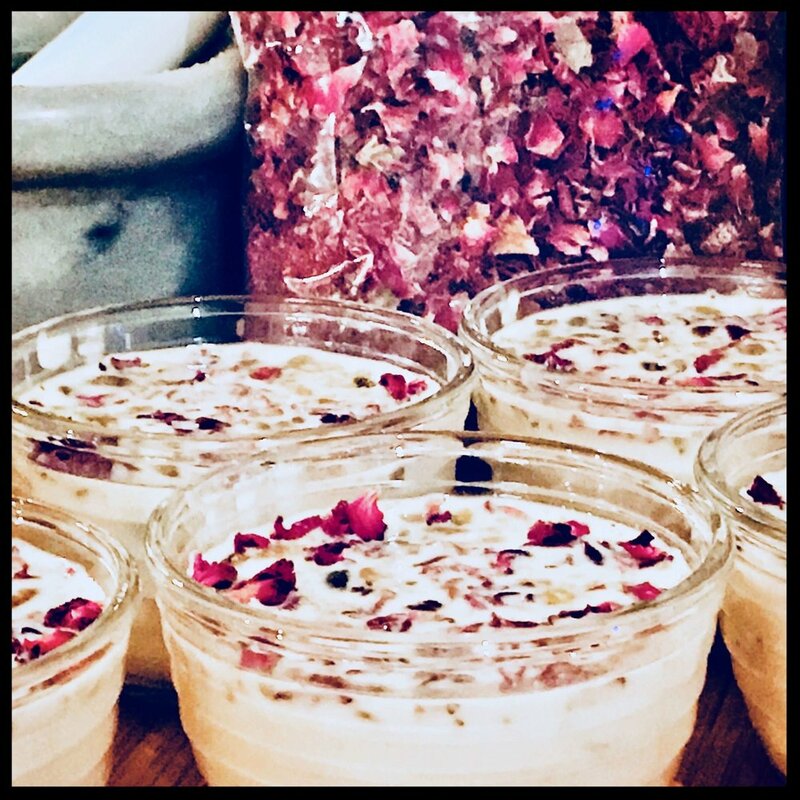 In modern day India people continue to make kulfi with the traditional Mughlai flavors, but the flavor profile has expanded to include fruit and floral based offerings including rose, lavender, mango, apple, orange, strawberry, and even avocado. The traditional method of making kulfi is a time-intensive process that requires slow cooking milk and sugar over a low flame with near constant stirring until it thickens and reduces by half, creating a distinctive caramelized base that is sweet and layered with flavor. In the version I’ve provided here, I tried to make this luscious dessert less intimidating and more accessible to the busy modern cook by using store-bought condensed and evaporated milk, and incorporating edible rose petals, which provide an elegant twist to a traditional recipe. The result is an incredibly easy and flavorful dessert that doesn’t lose any of the complexity or "wow factor" of traditional kulfi, while leaving you with enough time to make yourself a nice cocktail to enjoy in the quiet moments, just before your guests begin to arrive. Place cardamom pods in a mortar and crush lightly with the pestle until the pods crack open. If you don’t have a mortar and pestle, place the pods between two paper towels and lightly crush them with a rolling pin or the flat end of a glass. Combine the sweetened condensed milk, evaporated milk, and cardamom pods and seeds in a small saucepan over medium-low heat. Stir until well combined and heated, but not bubbling. Remove from heat and let cool completely. Once cool, remove the cardamom pods. Whisk in the heavy cream, rosewater, pistachios and rose petals. Pour into popsicle molds, ½ cup glass jars with lids, or a parchment lined bread pan. Cover with the accompanying lids or plastic wrap and freeze until firm – at least 12 to 24 hours. * Note: Rose water and dried rose petals can generally be found at most Mediterranean or Middle Eastern grocery stores or online . 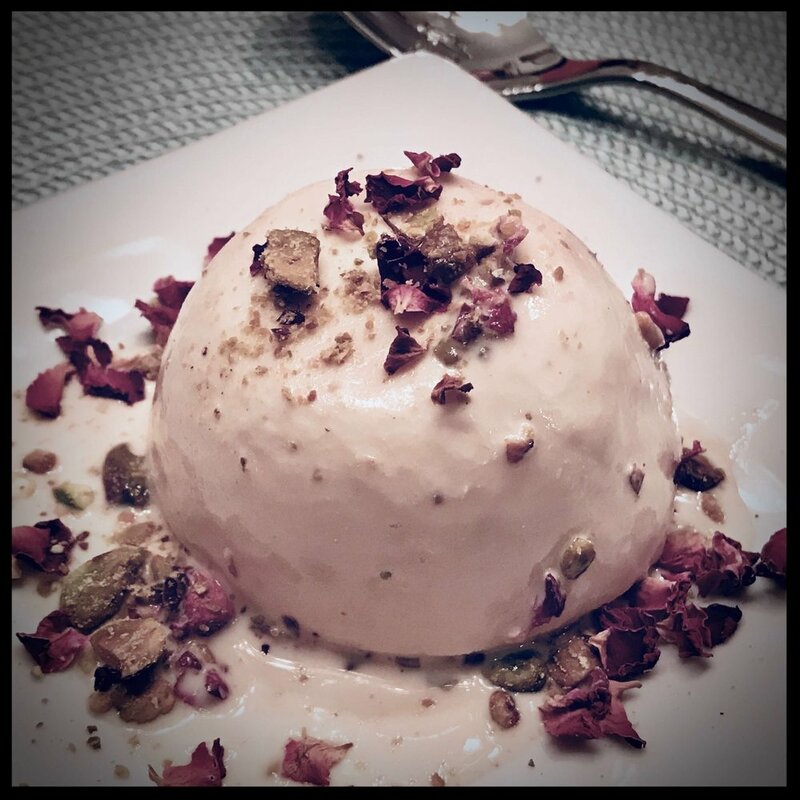 Sprinkle some dried rose petals and pistachios on the serving plates and set aside until the kulfi has defrosted and is ready to serve. Pull the molds out at least 15 minutes prior to serving or dunk the molds in a bowl of warm water to loosen the edges. · If frozen in popsicle molds, pull the kulfi out of the mold and on to prepared plates. · If frozen in small jars, run a thin spatula or knife around the edges to loosen and invert the kulfi on to prepared plates. · If frozen in a bread pan, run a knife or spatula around the edges to loosen and invert onto a cutting board and cut into squares. Place squares on to prepared plates. Sprinkle with additional dried rose petals and pistachios and serve immediately.